Allocasuarina luehmannii (buloke or bull-oak) is a species of ironwood tree native to Australia and its wood is the hardest commercially available. The evergreen tree typically grows to a height of 10 to 20 metres (33 to 66 ft) and usually produces a clear trunk. It is moderately to long-lived, usually over 15 years with a moderate growth rate. It is dioecious with male and female flowers on separate plants, which flowers in spring. It is known as having the hardest wood in the world, with a Janka hardness of 5060 lbf. The cladodes are 8 to 22 millimetres (0.31 to 0.87 in) long with 10 to 14 teeth. They are sometimes waxy, of slightly greater diameter near their apex than their base. The species occurs across a vast region of eastern and southern Australia, mainly north and west of the Great Dividing Range, within the Murray-Darling Basin, and within the states of New South Wales, South Australia and Victoria. Its extent of occurrence has been greatly depleted by clearing for cereal cropping and pasture development. It is an important food resource for the endangered southeastern subspecies of the red-tailed black cockatoo in the Wimmera region of western Victoria, where some remnant stands are threatened by farming practices  It grows on a range of soil types, mainly sandy loams, and is usually found on lower parts of the landscape. It tolerates acid, alkaline and moderately saline soils. 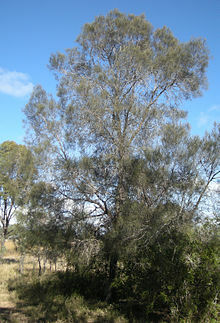 The Shire of Buloke in Victoria, Australia is named after this tree species. The species was first formally described as Casuarina luehmannii in 1900 by the Botanist R.T. Baker in the paper On two new species of Casuarina in the Proceedings of the Linnean Society of New South Wales. It was subsequently reclassified in the Allocasuarina genera by Lawrence Alexander Sidney Johnson in 1985 in the Journal of the Adelaide Botanic Gardens. Bull oak tree, coastal Central Queensland. ^ a b "Allocasuarina luehmannii". Factsheet. Florabank. Retrieved 28 January 2017. ^ Johnny W. Morlan. "Wood Species Janka Hardness Scale/Chart By Common/Trade Name A - J". The World's Top 125 Known Hardest Woods. Archived from the original on 26 April 2012. Retrieved 20 December 2011. ^ "Allocasuarina luehmannii (R.T.Baker) L.A.S.Johnson". New South Wales Flora online. Royal Botanic Garden, Sydney. Retrieved 28 January 2017. ^ Cheal, D.; Lucas, A.; Macaulay, L. (2011). "National Recovery Plan for Buloke Woodlands of the Riverina and Murray-Darling Depression Bioregions" (PDF). Department of Sustainability and Environment, Melbourne. p. 1. Retrieved 24 April 2018. ^ Joseph, L. (1982). "The Red-tailed Black-Cockatoo in south-eastern Australia". Emu. 82 (1): 42–45. doi:10.1071/MU9820042. ^ "Buloke Shire - Buloke Shire Council". Retrieved 15 April 2015. ^ "Allocasuarina luehmannii (R. T. Baker) L. A. S. Johnson Bull Oak". Atlas of Living Australia. Global Biodiversity Information Facility. Retrieved 28 January 2017. This page was last edited on 30 March 2019, at 05:22 (UTC).